Today, we’re updating our support for team roles in the Dashboard: we’ve made what’s there clearer and we’re also adding two new roles. If you haven't seen this part of the Dashboard before, we support you giving as many team members as you like access to your Stripe account. 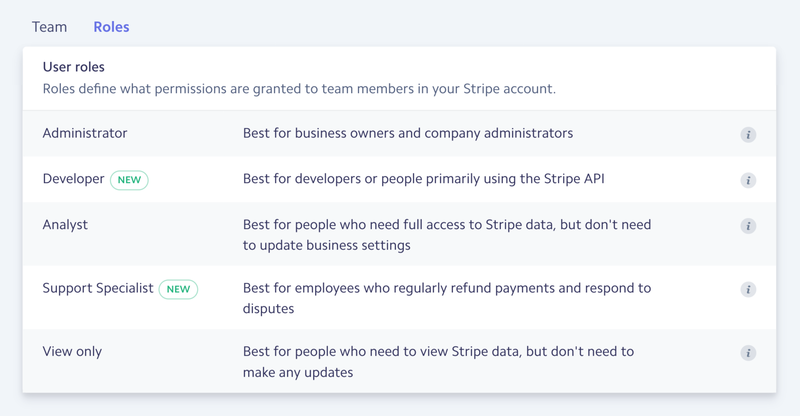 When we first added teams and roles to Stripe, we only provided three access levels: administrator, read and write, and read-only. 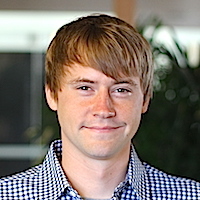 We’ve heard feedback that different job functions need a more distinct set of permissions when accessing Stripe accounts. Now, users assigned the new Developer role can access API keys and most settings, but cannot edit any team or bank account settings. We renamed Read & Write to Analyst, but the permissions remain the same. Users assigned the Support Specialist role can view most data (such as Subscriptions plans, payment data, or charges marked as fraudulent in Radar) and refund charges, but cannot edit settings or modify rules. Since many of your team members may be assigned this role, we limit what aggregate financial data they can access, such as gross volume or payouts. There are more specific details here. You can apply the new roles in your Dashboard settings. We hope these granular roles provide more flexibility to tailor access for your teammates and help ensure that sensitive information and actions are protected. If you have any questions or feedback, please let us know!